The usual suspects... Ubuntu first! Hm, actually not the situation I was looking for but okay can't be too difficult to get this piece of hardware up and running. Following the output of syslogd (or dmesg if you prefer) the device has been recognised successfully but we got stuck in the initialisation phase. Oct 12 08:17:24 iospc2 mtp-probe: checking bus 2, device 5: "/sys/devices/pci0000:00/0000:00:1d.7/usb2/2-4"
But still no reaction on the external display which supposedly should have been on and green. Just to be on the safe side and to exclude any hardware related defects or whatsoever - you never know what happened during delivery. I moved the display to a new position on the opposite side of my laptop, installed the display drivers first in Windows Vista (I know, I know...) as recommended in the manual, and then finally hooked it up on that machine. Tada! 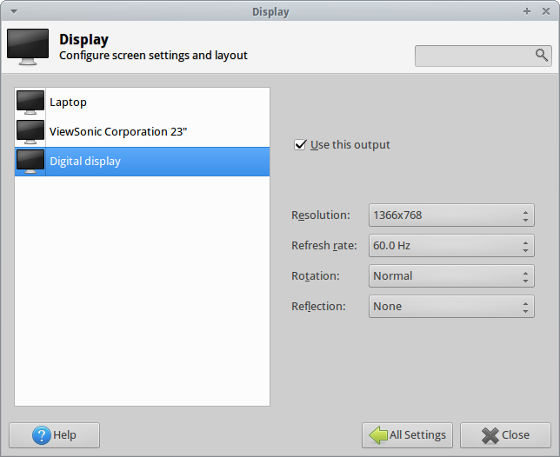 Display has been recognised correctly and I have a proper choice between cloning and extending my desktop. Oct 12 17:51:36 iospc2 mtp-probe: checking bus 2, device 6: "/sys/devices/pci0000:00/0000:00:1d.7/usb2/2-4"
Oct 12 17:51:36 iospc2 kernel: [ 2315.426589] udlfb: Reallocating framebuffer. Addresses will change! Okay, back to the original situation in which udl is allowed and udlfb blacklisted. 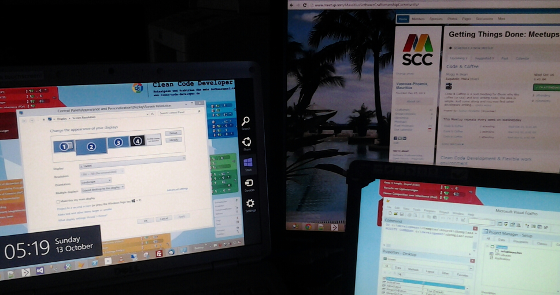 Now, the logging looks similar to this and the screen shows those maroon-brown and azure-blue horizontal bars as described on other online resources. Oct 15 21:27:24 iospc2 mtp-probe: checking bus 2, device 5: "/sys/devices/pci0000:00/0000:00:1d.7/usb2/2-4"
Next, it's time to enable the display for our needs... This can be done either via UI or console, just as you'd prefer it. 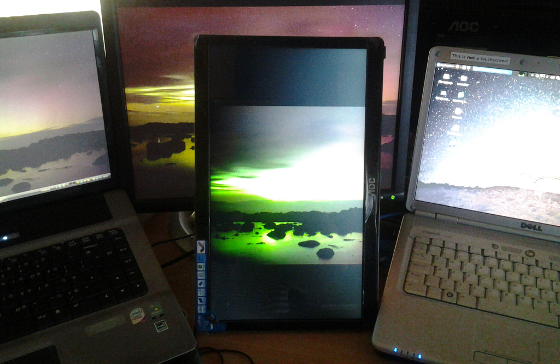 New kernel, new display... The external USB display works out-of-the-box with a Linux kernel > 3.9.0. Despite of a good number of resources it is absolutely not necessary to create a Device or Screen section in one of Xorg.conf files. This information belongs to the past and is not valid on kernel 3.9 or higher. Of course, I wanted to know how the latest incarnation from Redmond would handle the new hardware... Flawless! Most interesting aspect here: I did not use the driver installation medium on purpose. And I was right... not too long afterwards a dialog with the EULA of DisplayLink appeared on the main screen. And after confirmation of same it took some more seconds and the external USB monitor was ready to rumble. Well, and not only that one... but see for yourself. This time Windows 8 was the easiest solution after all. I can highly recommend this type of hardware to anyone asking me. Although, it's dimensions are 15.6" it is actually lighter than my Samsung Galaxy Tab 10.1 and it still fits into my laptop bag without any issues. 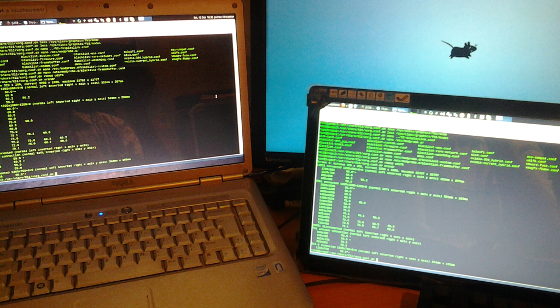 From now on... no more single screen while developing software on the road! Meanwhile I upgraded my system to Saucy Salamander (Ubuntu 13.10) and the newer kernel 3.11.0 or better said the udl module doesn't activate the screen anymore. Although the hardware is correctly identified it won't display anything. After some additional searching I came across a bug report on Launchpad: Regression: DisplayLink DL-195 fails with EAGAIN after upgrade from 3.11.0-031100 to 3.11.0-11 which shedded some light on my issue, too. As described above, I went from the default kernel (3.8.x) in Ubuntu 13.04 to an upstream kernel 3.9.0. Due to the recent upgrade to Saucy Salamander my system went back to an Ubuntu specific kernel 3.11.0-12-generic and the 'broken' display. Currently, I'm back to a vanilla kernel and thinks are working as expected.